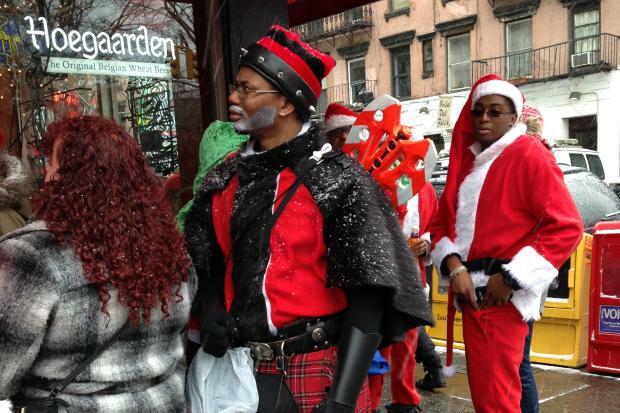 EAST VILLAGE — The city was crawling with Kris Kringles Saturday morning as SantaCon, the annual North Pole-themed pub crawl, got off to a crowded start. SantaCon, in its 19th year, is now celebrated worldwide — but the New York contingent of the celebration was kicked out of Midtown after complaints that too many participants veered on to the naughty list rather than behaving nicely in 2012. This year's organizers have attempted to clean up the roving Santas' acts, sending out text messages urging participants not to "f__k with kids, cops, bar staff or NYC." MetroNorth banned drinking on its trains Saturday, which tamed the festivities for some Santas off the bat. "We used to start drinking at 7 a.m. on the train. It's a pretty awful idea, actually, it can ruin your day instead of making it fun. This is the first year I didn't,” said Ryan Smith, 29, of Beacon, N.Y. The Second Avenue bars The 13th Step and The Thirsty Scholar were at capacity before noon, and Santas lined up in front of Webster Hall. Jordan Brown, a manager at the Village Pour House, said SantaCon easily surpassed St. Patrick's Day for the last two years as the bar's busiest day. "We'll make more today than we'll make in any single day the entire year," said Brown. Despite the obvious profitability to local bars, some participants still think of SantaCon as it began, as an anti-consumerism celebration. "It's anti- all this nonsense, the consumerism, Black Friday,” said Alejandro Morales, 36, a ten-year SantaCon veteran. But he also said SantaCon had changed over the years, calling it "too fratty." “Now we have to go against the grain of SantaCon,” said Morales’ friend Steve Valley, who was dressed as a reindeer. They said they will continue the tradition, and were even flying to Portland to celebrate SantaCon there. "It's our Christmas. We don’t celebrate on Christmas. This is what we do," Morales said. The aftermath of last year's SantaCon caused an uproar in 2012, and politicians called for an end to the SantaCon "scourge" that led to public urination, vandalism and arrests in the past. One angry Santa who had fallen on his face and knocked out front teeth was taken away from an emergency room in handcuffs by police, swearing at the officers while children were present, sources said. Abby Ehmann, 54, one of the original founders of the gathering when it was an anti-shopping party frequented by Burning Man devotees and other creatives, has derided the mainstream convergence as a "puke fest" co-opted by college kids. Ehmann founded an alterative pub crawl this year for "sober kid-dragging grown ups" called SantaCon Detour. Another alternative, Gay SantaCon, started with a midday brunch for LGBTQ and supportive santas who wanted to celebrate. That route was set to end at the historic Stonewall Inn, at 53 Christopher St. and invited santas of any race, religion or sexual orientation to join.